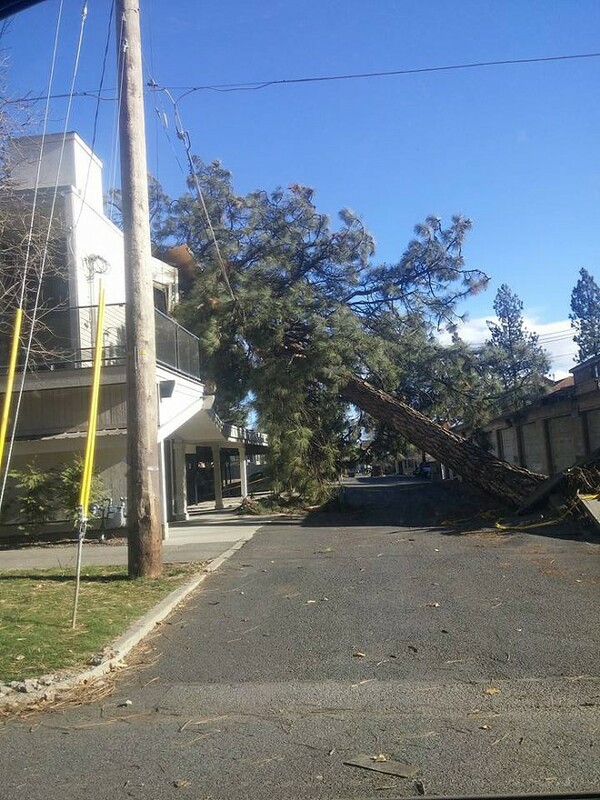 As of last night, Mayor David Condon and City Councilman Mike Fagan were without power as a result of the historic windstorm that blew through the region last week. Council President Ben Stuckart was also without power as well until he received a text from his wife during the weekly council meeting notifying him that it was back on. Stuckart joked that he was going to head home early, but instead stayed to hear updates about the storm from an Avista representative and the mayor. “This has been absolutely the worst weather event that our company has experienced in our 126-year history,” said Steve Trabun, Avista regional business manager, explaining that the windstorm resulted in 180,000 customers without power. As of Monday evening, 153,000, or 85 percent, of those customers had their power restored and 132 crews, which had been called in from nearby states as well as Canada, were working on the remaining 27,000 left without power, he said, most of which were in the heart of Spokane. Trabun said that restoring power is very difficult work for crews. For instance, he said a crew went out yesterday for 16 hours and was only able to restore power for 8 customers. He said that “ground zero” for the windstorm was the 99203 zip code, which encompasses much of the South Hill. Trabun said that he’s heard suggestions that Avista just put it lines underground to avoid situations like this. While Avista does that for newer construction, it’s just not practical for more established neighborhoods, he said, noting that Spokane is built on top of very dense basalt rock. The council also heard a report from Mayor Condon on the windstorm. He said that at the peak of the windstorm, 60 intersections were without signals. “We now as of today have only 9 intersections without power,” he said. “We received 2,289 calls to the 911 system between 1 pm and 9 pm on the day of the storm,” he continued, adding that it received another 800 calls for medical incidents, structure fire, gas leaks and other calls for service. Police, he said, also arranged extra patrols for neighborhoods without power. Condon also said that all the city’s expenses will be paid for out of reserve funds or grants from the state.